Metacarpal fractures are common hand injuries. They can occur from a variety of injuries such as a fall, a motor vehicle collision, or striking the fist against a hard surface. There are five metacarpals, one for each finger and the thumb. The metacarpals contribute to the bony architecture of the hand. 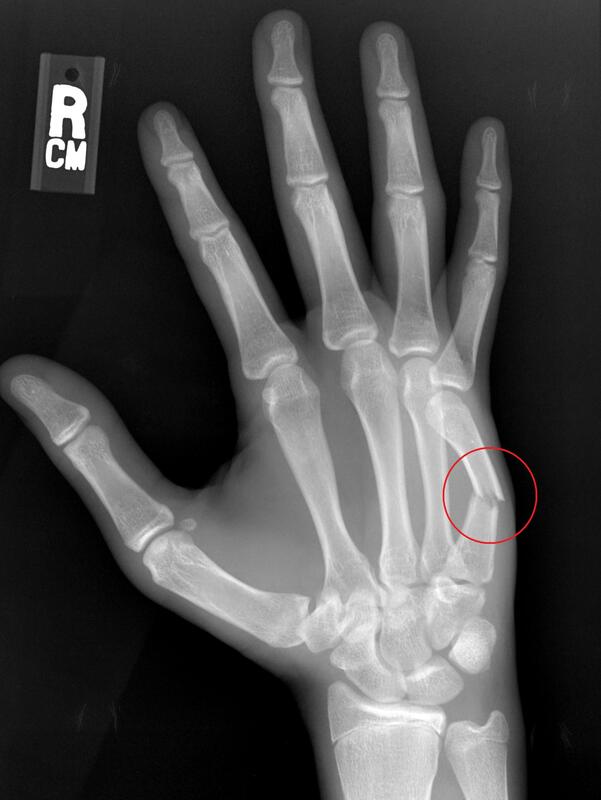 Satisfactory healing of this fracture is important to restoring hand function. 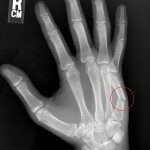 A fracture of the metacarpal neck of the small finger is sometimes called a “boxer’s fracture,” as they can be seen in punching injuries. The treatment plan will depend on the severity of the fracture and the patient’s medical condition and activity level. Most people have fractures which are well-aligned, and, therefore, do not require surgery and are treated in a splint or cast. Follow-up x-rays are obtained to evaluate how the fracture is healing. Hand therapy is sometimes necessary to improve strength and range of motion. Some patients with displaced fractures can be treated with manual realignment of the fracture. This is performed in the office or emergency room with local anesthesia (numbing medicine). Once the bones are “set,” a splint is placed to maintain the alignment. Surgery may be recommended to patients with more severe fractures, such as those with unsatisfactory alignment. The surgery is performed as an outpatient using either regional anesthesia or general anesthesia. During surgery, the bones are realigned and stabilized. In some cases, a low-profile plate and/or screws are used to fix the bones internally. This is called “open reduction and internal fixation” and requires an incision on the back of the hand. In other cases, temporary pins are placed through the skin to stabilize the bones while they heal. This is called “closed reduction and percutaneous pinning.” The pins can be removed in clinic after a few weeks. Other options which are less commonly used include intramedullary nail fixation and external fixation. Which technique is used depends on the fracture pattern and is often determined in the operating room. The bone healing process takes about 6 weeks, but full recovery can take a few months. Rest and elevation of the hand above the level of the heart is very import for the first few days after surgery to reduce swelling. Shoulder and elbow range of motion exercises are important to help prevent stiffness in these joints. The first few days after surgery can be painful, and medications will be prescribed to help. These medications should be weaned as the pain subsides. Your wrist and fingers will be protected in a plaster splint after the surgery. The splint will be removed in clinic after a few days and a removable splint will be provided. At that point, most patients can begin gentle wrist and finger range of motion with the oversight of a hand therapist. However, some patients need an additional few weeks of splinting to protect the repair, depending on the severity of the fracture. Avoid heavy lifting or use of the hand until the fracture heals. Pain, swelling, and stiffness gradually improve over time. Most patients can return to more normal function at about 2 months post-operatively, but maximum improvement can take 3-6 months. Recovery time varies among patients. Possible complications include pain, bleeding, infection, stiffness, nonunion, malunion, hardware failure, and damage to the surrounding nerves and blood vessels. A fracture which fails to unite is known as a nonunion. A fracture which heals with deformity is known as a malunion. Other complications are also possible but are uncommon. Adequate nutrition is important during the healing and recovery process. If you smoke, reducing or eliminating tobacco use will decrease your risk of complications. Complying with the therapist’s recommendations is very important to maximize your result. The natural tendency of the hand after trauma is to become “stiff” and swollen. Dedication to a hand therapy program can be valuable in reducing the chance of complications and restoring function. If you have an injury to your finger, hand, wrist or arm, please call the Raleigh Hand Center promptly at 919-872-3171 to be evaluated by an orthopaedic hand specialist. The material provided on this site is intended for general information only and does not constitute medical advice. This does not replace direct evaluation by a physician.